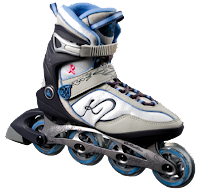 The Andra is the skate for the woman who wants a high-performance skate at a low price. The Andra comes with an 80mm wheel ABEC5 bearings and our new Diecast Aluminum Frame. The Andra is designed to fit a woman's foot and looks as good as it fits.